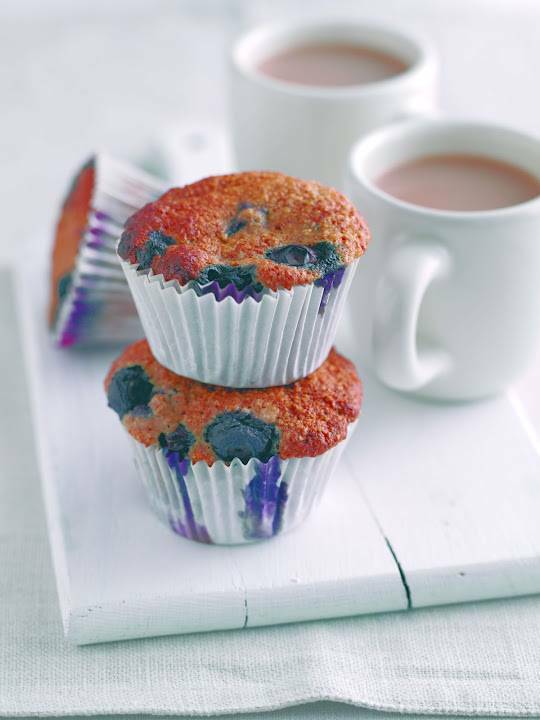 Line 18 sections of two muffin tins with paper cases or grease lightly with a little oil. Mix the flour, bran, baking powder, bicarbonate of soda and a little salt together in a mixing bowl. Add the yogurt or buttermilk, oil and vanilla to a second, smaller bowl then add the eggs and sugar and fork together until smooth. Add to the bowl of dry ingredients and fork together until just mixed. Add the blueberries and mix briefly, being careful not to overmix. Divide the mixture between the sections of the muffin tin. Bake at 200oC (400F) Gas mark 6 for about 20 minutes until tops are firm when pressed. Lift out of the tin, transfer to a wire rack and serve while warm, or leave to cool completely. "Creative Mondays Blog Hop Week 9 : Breakfast Bars…." "Grab my Blog Hop Button…"
I love whole wheat recipes and I've got some blueberries sat in the fridge that need using. These would be fantastic for breakfast! My two favorite muffins in one! These sound amazing.